Showers early, then cloudy overnight. Low 48F. Winds N at 10 to 20 mph. Chance of rain 50%. He married Mildred in September 1954. They moved in 1956 to Bandon, where they built a loving home. 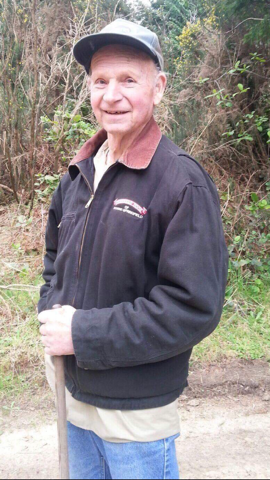 Dave was a cranberry grower for Ocean Spray for many years along with being a commercial fisherman, an EMT when Bandon Hospital had its ambulance, and a member of the Bandon Volunteer Fire Department in the 70's. Dave also owned and operated Dave's Radio and TV which several years later evolved into Dave's TV and Radio Shack then finally Dave's Radio Hut in Bandon. Among other things, Dave was a member of the Bandon Lions Club in the 70's and early 80's and a life member of the Bandon Masonic Lodge and Shriners. Dave is survived by his five children and their spouses, Gwen and Eddie, Gerry and Wanda, Lori and Chris, Ben "Dave II" and Sue, and Stacy and Paul; sister and brother-in-law, Mary and Lanny Boston; sister, Joyce White; 15 grandchildren; 17 great-grandchildren; and two great-great-grandchildren. He was preceded in death by his brother, parents, and loving wife of 52 years, Mildred. He was a kind, helpful, and loving husband, father, father-in-law, papa, uncle, brother, brother-in-law, and friend. Dave will be deeply missed by all who knew and loved him. I moved to Bandon 21 years ago with Gerry, Dave's daughter. 3.months later my own father died of cancer and heart failure. Dad was much more soft spoken than Dave and would never tell like it was. So it took me some time to get used to this outspoken male figure.We bonded over gardening and the conditions of the trees and bushes in his orchard. I watched his happy days in his farm, and his frustrations as his hearing left him little by little until he lived in a world of silence. He would look around, his own thoughts bouncing around in his head. The way I I would use to describe Dave was that he wasn't a quitter. He fought for every penny he earned. And in the end, he fought for every breath he took.